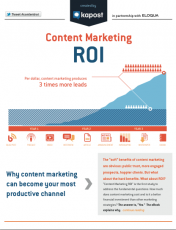 Marketers often ask us how they can define the ROI of content marketing. It’s a great question — and tough to answer. If you are trying to justify content marketing spend, check out this new eBook from Kapost and Eloqua called Content Marketing ROI (Note: Registration is required). This eBook provides good details around how to set up your content marketing team and prove its value, and my favorite takeaways are below. 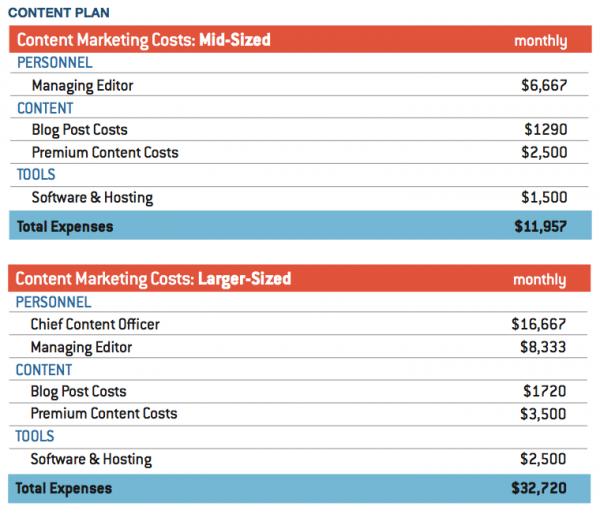 How much does content marketing really cost? This chart outlines typical monthly costs for mid-size and large businesses that produce two blog posts per week plus a piece of premium content per month. You can obviously adjust these figures to align with your staff and deliverables. How does content marketing compare to other lead generation activities? If you are like the 66 percent of B2B organizations that use content marketing to generate leads (according to the B2B Budgets, Benchmarks and Trends research), it’s helpful to understand how content marketing compares to other lead generation activities. Kapost and Eloqua walk through an exercise in which they compare content marketing to paid search marketing, which is cited as the most cost effective method in marketing. The guide provides the specific rationale for the calculations, but the authors conclude that content marketing costs 31 percent less than paid search for mid-size organizations and 41 percent less than paid search for large organizations. This is a good starting place when you need to make the case for content in your organization. While these values will vary by industry, it’s an interesting way to compare spend that may be valuable for your organization as you justify cost. What else can I do to justify content marketing? Sometimes you need to start at the beginning. Our CMI consultants provide ideas on how to explain content marketing to the C-suite. If you want content marketing to work, it needs to be more than a campaign. Nate Riggs shared three strategies for changing your company culture to support content marketing. It can help to work with other areas of the organization to build loyalty/buy-in to the content marketing program. Our CMI contributors explain how you can find internal allies for content marketing outside the marketing department. 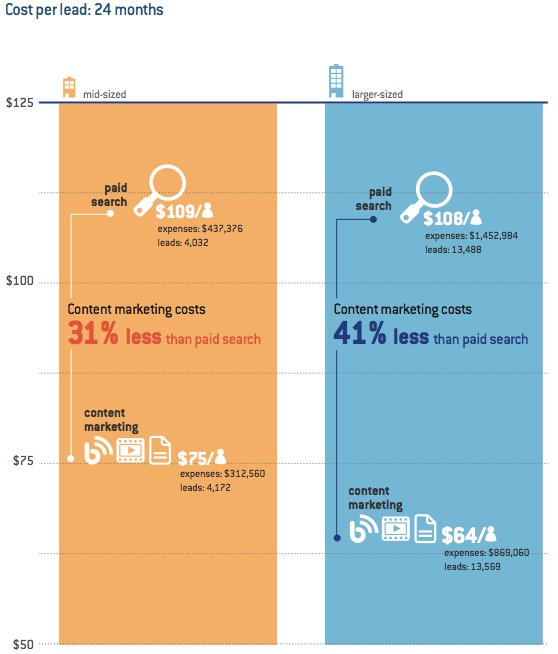 I think this guide, Content Marketing ROI, is helpful for laying out the costs associated with content marketing and helping marketers understand how costs compare to paid search. What other techniques do you use to help justify the cost of content marketing in your organization that may help others? *Disclaimer: Eloqua and Kapost are sponsors of the Content Marketing Institute/Content Marketing World, but this does not impact our editorial.